Apple frenzy is now hitting Indians, as the latest device to be launched in India: iPhone 5S has been sold out completely within 24 hours, and there is a great demand of this handset everywhere. Such is the scarcity that 16 GB of 5S is being sold in black at some locations of Delhi, and the price as go as far as Rs 80,000, which is normally available for Rs 53,500. The other model: iPhone 5C which was launched alongside 5S is still available but it has the stigma of ‘economical’ attached to it, and people are not that keen to go for it. 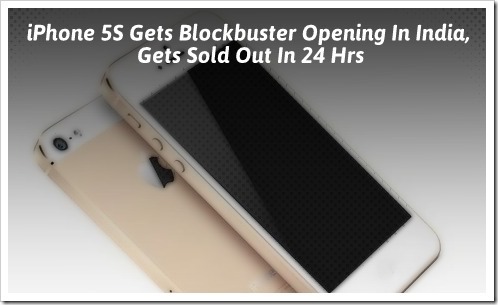 It is the 5S which is riding the frenzy wave across country, and people are tremendously excited about it. As per reports, retailers of Apple products have sent repeated SOS to the management, and asking for immediate delivery of the handset. It is speculated that it will take another day or two before the stock is again filled. When iPhone 5S and 5C were launched on November 1st in India, Apple has reportedly stocked 30,000 units out of which only 6000 units were of 5S, which were consumed within no time. Reliance Communication was supplied with 2,700 units of 5S, and when after they introduced a unique EMI scheme for these models on November 1, all their stock was consumed within a day and a half. Bharati Airtel, the largest telecommunication provider was supplied with 700 units of iPhone 5S, and that too were gulped down by Apple crazy fans in no time. By afternoon of 4th November, Apple retailers all over the country declared that Apple 5S is sold out. Apple distributors in India: Redington and Ingram Micro were immediately contacted by retailers all across the country to send more units; but they have little option. Due to Diwali season, shipping and distribution network is moving at a lackluster pace, and the delivery of fresh stocks is not possible before Wednesday or Thursday, as per insiders. Even multi brand retailers such as The MobileStore, PlanetM, UniverCell and Future Group have declared that they don’t have the stock anymore. Some skeptics have claimed that it is a tried and tested marketing strategy of Apple, and it artificially creates demand to add to the excitement and craze. But whatever it is, it has surely clicked, and Indians are now going berserk for this particular model of iPhone. People are ordering 5S via foreign locations such as Singapore, Hong Kong and Dubai and are even willing to pay the extra custom duty on the handset. This Apple frenzy is quite normal in other countries, but for Indians, this is something new. Steve Jobs would have been proud to see that the country which had provided him spiritual respite years ago, is finally warming up to the Apple addiction. 6000 iPhone 5S for a country like India is too low, I don’t consider it as ‘sold out’ but as low stock supplied to vendors.